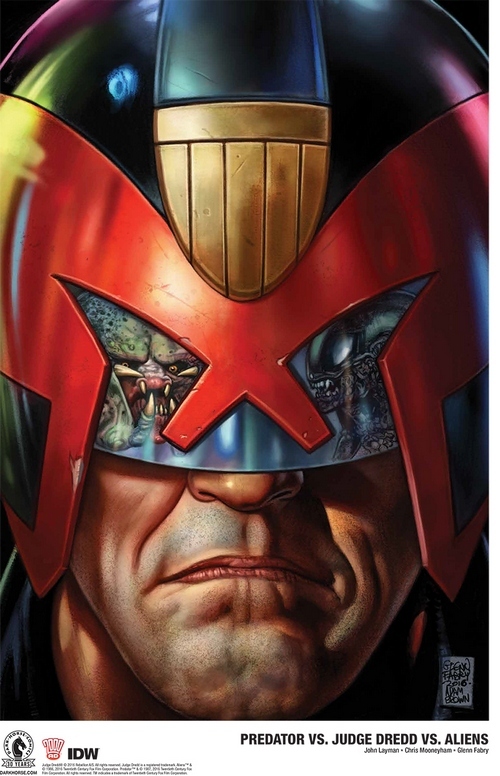 FOR EMERALD CITY COMIC CON: Announced today at Emerald City Comicon, three of the universe’s most feared figures cross paths this summer in the ultimate science-fiction crossover: Predator vs. Judge Dredd vs. Aliens! Written by New York Times best-selling and Eisner Award–winning author John Layman (Chew, Mars Attacks: Occupation) with stunning interior artwork by Chris Mooneyham (Five Ghosts, Predator: Fire and Stone) and iconic covers by Eisner Award winner Glenn Fabry, this series will be the wild ride of the summer for readers everywhere. The crossover pits the legendary lawman Judge Dredd against the universe’s supreme hunters, the Predators, as they both try to survive an onslaught by the galaxy’s ultimate killing machines, the Aliens.